Antes de nada, decir que escribo este homenaje a Sakaguchi antes de lanzarme en viaje marítimo hacia el Norte del Japón, en busca de paz primordial, de la vista del mar con el horizonte al infinito, y echando de menos aquellas viejas lecturas de Conrad o Poe. Reiros lo que querais, pero yo no soy como aquellas gentes que lo único que parecían entender era la moda actual, y cuyas vidas consistían en un esfuerzo constante para no ser dejadas atrás por los nuevos tiempos. 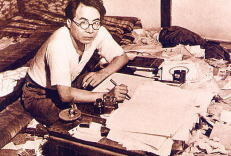 Y estas palabras en cursiva, pertenecen a un oscuro escritor japonés, nacido en 1906 en Tookamachi, cerca de Niigata, que murió en la pobreza el año 1955. Se trata de Ango Sakaguchi, autor sin ninguna edición suya en inglés, que a mí me conste. Solamente unos relatos sueltos, "El Idiota" entre otros, Hakuchi(1946), incluído en la antología de la que escribía el otro día. Autor que nada más acabar la guerra, atacó por uno y por otro lado los esquemas morales y sociales que habían llevado a su país al desastre total. Y por cierto, no creo que sobre decirlo, ávido lector de los relatos de Edgar Allan Poe. Various species lived in the house: human beings, a pig, a dog, a hen, a duck. But actually there was hardly any difference in their style of lodging or in the food they ate. Internet ya se ha convertido hace tiempo en una inmensa biblioteca de textos que jamás serán leídos por un porcentaje ni de mucho cercano al que, tan relativamente importante, corresponde a la cantidad de gente que intenta buscar la receta de la crema pastelera, o el de la cantidad de gente que quiere encontrar cuáles fueron sus malditos ancestros. Pues aquí presento uno de estos textos, tan fundamental en la historia japonesa como puede serlo el de esa Constitución que redactaron el señor MacArthur y sus colegas de guantes negros. Es un documento, escrito por un japonés, nada más acabar la guerra, en el que se pone en tela de juicio los dos grandes pilares en los que se basó la estrategia militar japonesa antes y durante la guerra. No sólo pone en tela de juicio, si no que machaca y destruye de una vez por todas, al mismísimo Emperador, y lo que es peor, a la perniciosa influencia del maldito Bushido en toda la cultura japonesa. Es la visión que años más tarde tuvo su representación cinematográfica en Tatsuya Nakadai destrozando la armadura de un viejo samurai (Harakiri o Seppuku, de Masaki Kobayashi). Este japonés no era otro que Ango Sakaguchi, del que repito, NO HAY edición inglesa de sus trabajos. No hay gran evidencia de que un japonés de hoy en día conozca siquiera su nombre. Y lo que es peor, a nadie parece importarle. La importancia del texto y de la obra y vida de Sakaguchi exigen una edición inmediata de su trabajo e ideas. Un escritor, que no sólo instó a levantarse al pueblo japonés contra las férreas disciplinas de ideas del pasado, sino que les animó a abandonarse en una decadencia que les permitiese olvidar ese pasado. Un estudio inmediato que nos aclare hasta qué punto han llegado hasta hoy en día la influencia de los trabajos de Sakaguchi. Porque la decadencia esta ahí, en la calle. Y es una decadencia puramente japonesa, que nada tiene que ver con la Occidental. Me permito copiar aquí el pequeño ensayo de Sakaguchi, titulado "Darakuron" (Teoría de la Decadencia), en inglés. Yet within the past half year the women who sent their betrothed off to battle with these glorious words and with heroic hearts have begun to pay their respects before their husband's mortuary tablets with but a cursory bow. Not far off is the day they will cherish images of new lives in their breasts. It is not the people who have changed. People act this way instinctively. What has changed is merely the surface of things. It has been said that one reason the Tokugawa Shogunate made the decision to refuse a pardon to the forty-seven loyal retainers and uphold the punishment condemning them to commit ritual suicide was due to a feeling of paternal sympathy, for if the retainers had lived out their lives to old age they would have suffered the shame of public display and someone would surely have appeared to tarnish their names. Such human feeling does not exist in today's laws. But it does remain to a large extent in the people. One feeling that is generally shared is the desire to destroy a beautiful thing while it is still beautiful. It was perhaps fifteen years ago when a student and his young lover decided to end their lives of love in virginal chastity by committing suicide together somewhere near Oiso. People viewed their act with great sympathy. I shared in those feelings myself several years ago when a niece I was extremely close to killed herself at the age of twenty-one. I was happy that she was able to die while still beautiful. At a glance she appeared to be a tasteful young woman, but she also possessed in her a fragile danger that made me fear she would fall to the very pit of hell. It was because I could not bear to see her live out that life that I felt this way. During the war, writers were banned from writing about the love affairs of widows. Though they proclaimed that war widows must not be corrupted into decadence, the true motive of the military politicians was in fact a desire to force these women to live out their remaining years as exemplars of virtue. The ability of the militarists to comprehend the potential for immoral behavior was astounding, not because they failed to realize that a woman's heart is quick to change, but because they knew it all too well. That is why they devised the prohibition. Throughout history Japanese warriors have said that they do not understand the true feelings of young women. On the surface, this view would seem to imply that they have devised a number of rough, boorish laws into what became known as Bushido to provide a bulwark against the weaknesses from which human beings suffer. According to the code a warrior must search through every blade of grass, even become a beggar, as he tracks his enemy in his efforts to avenge the death of his lord. But did such faithful retainers and filial children actually exist, who would hunt down their sworn enemies with the true passion of revenge? All they actually knew was the code of avenging their lord's death and the honor prescribed in that code. The Japanese people are fundamentally the least inclined to maintain a long standing vendetta. Their true nature is a carefree optimism that allows yesterday's foe to become today's friend. It is an everyday affair not only to compromise with yesterday's enemy, but to become wholly intimate with him, precisely because he was the enemy. We will serve two lords, even one who was our enemy yesterday. Since it would have been impossible to spur the Japanese people into battle had it not been for the edict that to be captured alive was a disgrace, we meekly submitted to the law, but our true nature was precisely the opposite. Japanese military history is based more on Machiavellianism than on Bushido. We are able to understand military history better by examining the way our true ego scrutinizes the deceptions that have taken place throughout history than by relying on mere historical fact. Just as the military politicians prohibited writing about the love affairs of widows, the warriors of long ago found it necessary to suppress their own weaknesses, not to mention those of their underlings, by relying on Bushido. Kobayashi Hideo claims that politicians lack resourcefulness and that they are a breed of people that merely administers and controls, but what he asserts is certainly not true. Most politicians act as he claims, but the few brilliant minds, ingenious in the way they use the laws of administration and control, take on the personas of the mediocre politicians, then pierce each era and each government with an expression of the will of an almighty being, stringing together a single historical will. For governments, history is not a matter of bringing individuals together, but rather one of absorbing individuals into the concept of an almighty being so that the shape of history, like government, will move to an almighty creativity. Who was it that conducted this war? Was it Tojo's branch of the military? It may have been in part, but it was also without a doubt that almighty being running through Japan: the irretrievable will of history. The Japanese people do nothing more than submissively accept their destiny at its feet. Even if politicians are not geniuses, politics under the veil of history possesses ingenuity, a unique will, and an unstoppable momentum that carries it forward like a wave in the open ocean. Who devised Bushido? It was the adaptability and the foresight of history. History has already figured us out. The prohibition edicts of Bushido that are designed to counter human nature and instinct are inhuman and they do contradict human nature, but the insightful way they are able to counter these traits is completely human. I even look on the Emperor System as a very Japanese (and thus a very creative) political construct. The Emperor System was not born with the Emperor. Though emperors at various times did plot their own conspiracies, they generally did not prove successful. They were exiled to distant islands or forced to flee deep into the mountains. In the end an emperor's existence was confirmed according to the political aspirations of others. Even sovereigns forgotten by society were propped up by cunning politicians who smelled the opportunity to improve their own positions. These people founded the Emperor System through a keen insight into the Japanese condition. But that insight did not necessarily require the Emperor. In his place Confucius, the Buddha Shakyamuni, or even Lenin could have been substituted. Circumstances simply did not permit them to take the Emperor's place. At the very least Japan's politicians (the nobility and the Samurai class) had sniffed out the necessity of an absolute monarch as a means to ensure the eternal rule they had envisioned for themselves. In the Heian Era the Fujiwara family, while giving support to the Emperor to ensure the success of its own selfish agenda, never questioned the fact that its men would be of lower rank than the Emperor. Yet they did not see that as a hindrance of any kind. The existence of the Emperor brought with it a new means of dealing with inter-family quarrels. Now younger brothers tried to usurp their elder brothers, who in turn sought to oust their fathers. The Fujiwara were instinctive opportunists whose aim was not only to live lives of pleasure, but to make the court government flourish in such a way that they could greet the Emperor with an odd formality that both delighted them and gave them a sense of satisfaction. Bowing reverently before the Emperor demonstrated their dignity, but it was also a way for them to feel dignified. What utter foolishness this is. We cannot find words to describe the absurdity of being forced to bow our heads each time the train turns toward Yasukuni Shrine, but for some people this display is the only way they are able to sense their own feelings. We laugh at their stupidity as they bow to Yasukuni Shrine, yet we ourselves do the same thing, only we do it in other ways. The difference is that we do not realize our own stupidity. As Miyamoto Musashi hurried on his way to duel under the pines at Ichijoji Temple he was said to have been about to bow reflexively before the god Hachiman as he passed by, but he abandoned the idea, deciding that it was not the proper time to ask for divine protection. Though this example is a reflection of Musashi's own personal idiosyncrasies, we also tend to bow spontaneously before the stupidest of things uttering solemn words of repentance; it is something we do unconsciously. The teacher of Confucian philosophy holds the sacred writings above his head reverently as if they are a gift from the gods, but in doing so he is merely perceiving his own dignity, his own existence. All of us in one way or another do the same thing. As a people who devote themselves to deception, Japanese people need the Emperor for the purpose of deception, but also for the purpose of true justice. Politicians, even if they do not sense the importance of deception, use their historical acuity not so much to ratify His importance, but to remove all sense of doubt from their own reality. Hideyoshi, when he attended the Emperor at the Juraku Mansion, shed tears at the grandness of the ceremony when he looked up to the Emperor in reverence, but he was actually confirming his own dignity within the confines of the Juraku Mansion. He was looking past the emperor, off to the gods and the heavens. Though this was what happened with Hideyoshi and not with other politicians, deception is even a tool of demons. The fact that even demons pray before the gods like children shows us that deception is not at all strange. There are countless contradictions that illustrate this point. In short, both the Emperor System and Bushido state that "the virtuous widow never looks at another man." This prohibition itself is not merely inhuman, it directly contradicts human nature. But in the same way that insight into supreme truth is very human, the Emperor System, though not the supreme truth or even natural, reveals crucial clues into historical insight and discovery that are difficult to dismiss out of hand. It is just that the superficial supreme truth and natural laws cannot be separated. The very desire to extinguish life from a beautiful thing while it is still beautiful shows a very restricted human nature. In the case of my niece I should perhaps wish that she had not killed herself, but instead had lived out her life to fall headlong into hell where she would roam in its vast dark wasteland. I myself in fact, who have taken up the path of literature, have found myself wandering vagrantly in this wasteland. Yet even so, I cannot rid myself of the petty desire that a beautiful thing end its life while still beautiful. An incomplete beauty is not beauty. Once she had made her inevitable descent into hell, perhaps then for the first time we would be able to call her miserable journey a thing of beauty, but then would we not have to see in a twenty year old virgin her sixty year old ugliness? I am not sure. I prefer a beautiful woman of twenty. "Once you are dead, life no longer has any meaning," or so the saying goes, but what does that really mean? In losing the war I just cannot blindly accept the idea that in the end the ones we should mourn the most are the spirits of those killed during the war. When I think of the sixty year old generals clinging ardently to their lives as they were dragged before the War Crimes Tribunal, I contemplate the fascinating allure of human life. I did not see their eyes, yet if I were one of the sixty year old generals I think I too would surely have clung passionately to life as I was being dragged before the courts. Not being able to imagine any other response leaves me in awe of life's curious power. I prefer a beautiful woman of twenty, but do the old generals also prefer a beautiful woman of twenty? And does mourning the spirits of the war dead also mean preferring a beautiful woman of twenty? If things can be defined with such clarity then I can feel at ease and even continue to chase wholeheartedly after such beautiful women, but the issue of human life becomes a more obscure problem than ever. I truly detest the sight of blood. When I saw a traffic accident occur right before my eyes I immediately turned the other way and fled. But I loved the fantastic destruction that took place in Tokyo. Though I shuddered in fear as the bombs and incendiaries rained down, terrified and panic stricken as the destruction raged, at the same time I felt as though I had never loved or felt such longing for humanity as I did during the firebombing. I held my ground there in Tokyo, refusing the kindness of a number of people who not only warned me to evacuate, but even tried to offer me places to stay in the countryside. I intended to make my final stand at the burned out air raid shelter of my friend Oi Hirosuke, but after we were separated when he was evacuated to Kyushu and I had lost my best friend in all of Tokyo, all I could do was try to conceal the sound of my breathing in that air raid shelter as I conjured up images of the Americans about to invade at any moment amid the heavy artillery shells exploding all around me. At the time I was calmly resigned to whatever fate awaited me. I thought that I might die, but I believed much more strongly that I would live. Yet to say that I had some kind of vision of how I would manage to come out of the ruins alive would be wrong. There were no thoughts in my mind beyond merely surviving. A miraculous return to life in a world so new and fresh it lay beyond all conception. That was the curious feeling I had; that my entire life would begin anew. But it was not that I felt it was crucial to stay in Tokyo so that I might experience these strange feelings of renewal. It was rather, you might say, that I had fallen under a strange spell. It was for that reason alone that I lived with my cowardly fear as the bombs fell all around me for two hours on the night of April 4, 1945. As tracers lit up the night sky overhead to the brightness of noon, my brother, who had just come to Tokyo, asked me from the air raid shelter if the light was coming from the incendiary bombs. I was so scared that it was all I could do just to tell him that the light was coming from the falling tracers. I was working part-time for Japan Films at the time, and just after the bombing of Ginza three cameras had been set up on the tower of the five-story building that housed our Ginza office to capture shots of the bombing formation as it passed overhead. When the air raid warnings sounded all of the people in the area, those in the streets, those looking out their windows or from their rooftops, all trace of them vanished. Even the antiaircraft guns were covered over to keep them concealed. There was no hint of human life anywhere except for the group of ten people on the roof of the Japan films building. Initially, firebombs rained down on Ishikawajima, but then the formation headed strait for us. I could feel the strength leaving my legs. I watched the cameramen in admiration, cigarettes dangling from their lips, so calm it disgusted me as they followed the flight of the bombers in formation. But I loved the magnificent destruction. The sight of humanity meekly resigned to its fate is a curiously beautiful thing. The grand mansions all over Kojimachi had disappeared as if by some cruel joke, while in their place stood only burning embers. And there was a well-to-do father sitting with his daughter on the grass of a canal bank, a red leather trunk sandwiched between them. In one spot if it had not been for the sparks rising out of the ruins one could have had a relaxing picnic. Here in Dogenzaka, part way up the hill amid the charred remains of buildings that had disappeared, was someone who was not actually a part of the bombing; it was a corpse that looked as though it had been hit by a car lying prostrate on the ground covered by a single sheet of corrugated tin. Nearby, a soldier stood with a bayonet rifle. People going to various places, people returning home, victims of the disaster, all made up an endless stream of flowing emptiness. People made their way through dead bodies on their way to wherever it was they were going, most not even noticing the fresh blood that littered the road, while those who did showed no more interest in the corpses than they would if they had been looking at waste paper littering the streets. The Americans who arrived immediately after the war said that the Japanese people they encountered all had blank, vacant expressions, but the procession of bombing victims emanated a blank, vacant look and possessed an immense emptiness that was a different emotion from the surprise and fear that one would have expected to see. They were the obedient children of destiny. There were two girls, one about fifteen, the other about sixteen, who were laughing. Their smiling faces were invigorating. Digging pottery out of the ashes with a charred bucket they kept watch over their only trunk as they played in the sun. I wondered whether they were so full of dreams of their future that the reality they were experiencing was not one of pain and suffering, or if their smiles were perhaps brought on by some great vanity. I took pleasure in seeking out the smiling faces of girls like these in the burned-out fields. Beneath the fantastic destruction our destiny was sealed, but there was no decadence. There was emptiness, but in the emptiness there was abundance. The ones who waded through the raging flames flocked together beside some houses that had begun to burn so as to warm themselves from the cold outside. They were only a few feet from those who were working feverishly to extinguish the fires, but they existed in a completely different world. An extraordinary love rising out of the great destruction. An extraordinary love rising out of the great destiny. In contrast, our faces upon losing the war were nothing more than expressions of decadence. Yet when compared to the astonishing mediocrity and banal inevitability of decadence, even the extraordinary love that came out of the great destruction and the beauty of humanity as it bowed meekly before its doomed fate felt like nothing more than the empty transience of a phantasm. According to the ideology of the Tokugawa Shogunate, killing the forty-seven retainers turned them into paragons of eternal loyalty, but all it actually accomplished was to save them from a slide into decadence. There is no way to prevent humanity itself from its natural degeneration from virtue to mediocrity, then finally into hell. Even if we establish moral codes such as those forbidding a virtuous widow from looking at another man or for a loyal retainer from serving another lord, there is nothing we can do to stop the degeneration of humanity. We can successfully preserve a woman's virginal purity by killing her, but when we hear the footsteps of decadence approaching with the inevitability of waves crashing against the shore we cannot help but remember that preserving her petty virginal purity through petty human action holds nothing more than the empty transience of a phantasm. The heroes of the special attack corps are mere apparitions; human history will begin with those who have become black marketeers. Widows being held up as apostles of virtue are mere apparitions; human history will begin with those who adopt visions of renewal. And finally the Emperor, he too is a mere apparition; a true imperial history will begin with the emperor becoming a common man. As with the living behemoth we call history, humanity itself is surprisingly massive. To be alive is truly the only thing of wonder. The aging generals brought before the War Crimes Tribunal did not slit their bellies. As they were led side by side into the courtroom we discovered a magnificent blueprint for humanity that was made possible by the end of the war; Japan had lost and Bushido had crumbled, but humanity had been born for the first time in the true womb of decadence. We must live! We must fall into decadence! Beyond this true path there is no easy way for humanity to be saved. I do not like harakiri. Long ago, a bleak but cunning schemer named Matsunaga Danjo was attacked and defeated by Oda Nobunaga who left him with no choice but to die in his castle with all his men. Right before his death he applied his life prolonging moxa treatment just as he would have on any other day, then thrust a gun into his face and blew his head off. He was more than seventy when he died, but he was still a lecher who flirted with women in front of others without thinking twice. I agree with the way this man killed himself, yet I do not like harakiri. Throughout the bombing I trembled in fear, but I was also enchanted by the beauty I found there. There was no need for me to think. That was because there was only beauty, no humanity existed. In fact there were not even any looters. The Tokyo of today is called dark, but during the war it was a perfect darkness such that no matter how dark it was, no one ever worried about robbers. We went out to walk around the black market in the middle of the night and slept with our doors unlocked. Wartime Japan was like an unreal paradise, overflowing with empty beauty in full bloom. But it was not the true beauty of humanity. If we were to forget about thinking, the world would be such a magnificent carefree spectacle. Even though we were all terrified that the bombing would not end, we felt better when we discovered how fascinating it was to forget our thoughts. I was a fool. I frolicked through the war with such a simple minded innocence. After the war ended our freedom was completely restored, but when that freedom was restored we began to notice our own inscrutable limitations and the way they impinged on our freedom. Mankind cannot live in eternal freedom. The reason why is simply that we live, we die, and we think. From a political standpoint reform can be carried out in a day, but people do not change so easily. From the first steps of human society in distant Greece to today, how much have we actually changed? Humanity...Humanity itself was not able to find a way to overcome all the horrific destruction or the ominous future it faced during the war. The war simply ended. Have the brave heroes of the special attack corps not already become black marketeers? Do the war widows not already have images of new lives swelling in their breasts? Humanity does not change. We have simply gone back to being human. Humanity will fall into decadence. Loyal retainers and holy virgins too will fall into decadence. Our fall cannot be prevented; we cannot be saved. Humanity will live and humanity will fall. there are no simple paths to salvation. We are not going to fall because we lost the war. We are going to fall because we are human, simply because we are alive. But can we save humanity from an eternal decline? Why is it that the human heart cannot face up to extreme hardships with the strength of steel? We are delicate and frail and thus strange creatures, but we are too weak to keep from falling into decadence. In the end we must kill the chaste virgin, we must devise Bushido, and we must prop up the Emperor. But we must each kill our own virgin, we must each devise our own kind of Bushido and our own Emperor; it is essential that people descend down their own correct path and they must descend to the very end of that path. It is also crucial that Japan fall in the same way. We must save ourselves by discovering ourselves once we have fallen to the bottom of the path of decadence. Political salvation and other shortcuts are nothing but superficial folly.